Blanc Height: 144 cm Weight: 36 kg BWH: 71-53-77 The goddess preceding over the land of Lowee. Her appearance doesn't exactly match her personality, as she tends to get very loud and angry very easily, and this short temper causes her to take her rage out on others, usually Neptune or the other goddesses. She also has a foul mouth, which can easily be demonstrated in almost any conversation involving her, even during the boss fight with her. 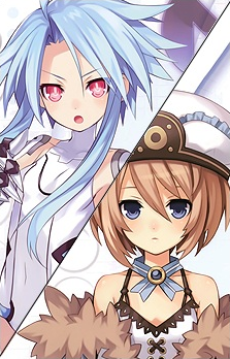 However, Blanc appears to be a shy, quiet type of girl who looks lifeless and dull in comparison to others. She enjoys simple, quiet hobbies like reading during her spare time or trying to find a relaxing spot to do so. White Heart Height: 146 cm Weight: 37 kg BWH: 73-55-77 White Heart is known for being the most violent of the four goddesses with a temper to match, she seems the least changed between forms in terms of personality. White Heart's appearance indicates she may be the youngest of the four, considering her body remains practically unchanged.